We've toured a number of darkrooms and digital workspaces over the years — and there are more in the works! You'll find all of them here for viewing via LensWork Online. While traveling the east coast for the LensWork Road Show Tour, Brooks Jensen was able to take a few days to visit LensWork alumnus Harold Ross and his wife, Vera, at their home and studio in Pequea, Pennsylvania. Harold's portfolio, Sculpting with Light, appeared in LensWork Extended #93. In October 2011 Brooks Jensen toured the studio of LensWork Alumnus, Jimmy Williams, in Raleigh, North Carolina. You can see Jimmy's portfolio, The Music Makers, in LensWork and LensWork Extended #93 and his portfolio titled Tuscany in LensWork Extended #95. By popular request, Witherill has produced this introductory video that presents an overview of his transition from traditional black-and-white classic wet darkroom photography to his current free-floating and highly stylized digital work. What may appear as two opposites are actually connected in a surprising logical line of artistic development. 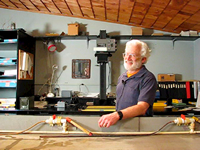 In October 2011 Brooks Jensen visited with Chuck Davis at his home and darkroom in Pacific Grove, California. Because Chuck is an underwater still photographer and cinematographer his workspace reflects his various talents. This tour is a unique and fascinating glimpse into an underwater photographer's world. Bruce Bambaum is well-known for stunning photographs as well as his tireless decades of teaching photographic workshops. 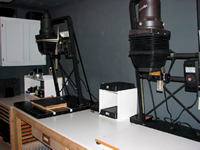 Some of his most popular workshops are offered ¡n his own darkroom, a facility constructed specifically for the dual purpose of instruction as well as to function as Bruce's personal darkroom. In this video tour, we see both sides of this facility. Tyler Boley has developed a reputation as one of the country's premier digital printing experts. His exquisite large-scale prints of both his work and the work of other photographers has demonstrated his mastery of the large-scale fine art photograph ¡n the digital age. His generosity to share with other photographers is manifest in his ever-present contribution to chat groups on the Internet and his logical, methodical methodologies. Mark Griffith's work as both a photographer and a workshop instructor has demonstrated that he is one of today's contemporary master printers. We talk with Mark about his innovative approach to improvising and building solutions to the darkroom problems he's faced over the years. We tour his darkroom facility and take a look at some of his unique and money-saving solutions to common darkroom equipment challenges. His extensive work photographing the life of the cowboys of the American West has earned Adam an international following. In this video, we talk with Adam about his work, his workspace, and tour his darkroom in the small community of — appropriately named Story, Wyoming. Don Kirby is certainly one of today's leading black-and-white photographers — both as an artist and as a darkroom technician. Our Editor, Brooks Jensen, visited Don and his wife, photographer Joan Gentry, in their newly constructed home in Santa Fe, New Mexico. It is not often that a fine art photographer gets to build a darkroom from scratch — or, more accurately, build a house around a darkroom from scratch. Long known as an accomplished photographer, technician, and workshop instructor, Ross is also the printer of the Ansel Adams Special Editions that have been so popular now for three decades. It was a real treat to visit with Alan Ross in his home and darkroom and see where he works to make his own stunning prints, as well as the large number of Adams Special Editions. We published some of Ryuijie's botanicals in LensWork #36 and later included several in our LensWork Special Editions and Photogravures. In this informal video, we talk with Ryuijie and tour his darkroom, home to his exquisite platinum-palladium prints — and his legendary collection of tequila! 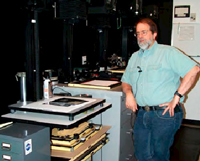 His well-known and popular workshop series on the "Expressive Print" are conducted in this darkroom. It is also where he produces his personal work. 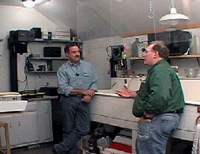 This darkroom tour includes a conversation about the myth of excellence being found in the equipment one uses — a myth John debunks by showing a few simple and easily available dark room tools and tricks that demonstrate it's the photographer, not the equipment, that really counts. Tucked up the hillside in a small ravine is one of photography's most famous homes — Wildcat Hill — where Edward Weston lived and worked. Now the residence of his grandson, Kim Weston, we are treated to a tour of Edward's original darkroom, still preserved pretty much as it was in Edward's time, just in back of the family kitchen in the main house. A peak at history preserved. In this video, we talk with Kim Weston in his darkroom on Wildcat Hill — site of his grandfather's (Edward Weston) famous home. Kim now lives, works, and teaches workshops there with his wife, Gina. Using much of the equipment handed down from his famous photographic family, he has explored his own creative path and vision in this famous place, the next generation in this famous photographic family. Already well-known for his stunning black-and-white landscapes, his new and current work is a complete departure delving into the world of color and semi abstraction. In this video tour of his workspace and home, Witherill discusses his transition to a new vision for his creative work, his transition to new tools and the digital workflow, and the spirit of creativity and artistry that bridge the two. In 2005, we started the LensWork Special Editions. Here is an inside look at the process and our darkroom.